It’s nostalgic feeling. Like nothing I can describe. Sure, you can move away, but somehow you just never seem to totally lose contact with the people you were close to when you were growing up. Especially the ones who still live in that same area. In my case, miles and time have separated us, but the memories and the friendships have not. The ties may have loosened for a while, but they are still there, and still intact. The memories keep us together. 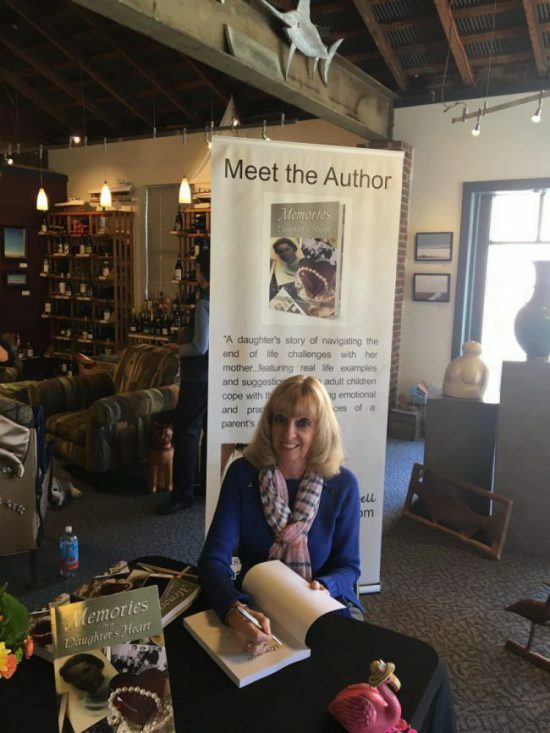 When my first book was published a few months ago, I wanted to have my first book signing in my hometown. Since the book is about my mother and the last years of her life, as well as dealing with the heartache and grief that accompanied that tragic event, it was only fitting to return to the town where I had grown up, and where my mother had been a beloved kindergarten teacher for many years. Where several of her friends still lived, and so did many of my school friends. You see, you can go home again. I did. It may not be exactly the same as you remember, but it’s still home. There are the same streets, the same houses, the same churches. The “downtown” area is still there, only with new businesses, several owned by friends I went to school with. My old high school is there, in the same location, but with an entirely new facade and totally modern interior. But it’s still there, and as we drove past it, so many memories flooded back I was just suddenly overwhelmed. Especially when I realized I was going to see so many of those high school friends again soon. My old house, or should I say my mother’s old house, is still there, looking almost the same, and for a brief instant I felt like we should turn the car into that U-shaped driveway and pick her up to go with us to my book signing. And every time I ride past it, my heart overflows and the memories leak out of my eyes. But then I realized…the book was about her, and about my losing her. How I felt; how I dealt with it. How other daughters can deal with the same tragedy and survive. If she were still here, which I still wish, none of this would be happening. This was the time I was going home to honor my mother’s memory by introducing the book I’d written about her. I didn’t know what to expect at all. A good friend from high school was hosting my event in her gallery. Like almost all of my classmates, she’d known my mother, like probably over half the town had. But after her being gone for ten years, would they still remember her? Did they ever! I cannot tell you how many people came by or called, or even emailed me to tell me they remembered her; they loved and missed her; how she taught their children, or their grandchildren. Several people came by just to tell me she’d taught them, and how they still remembered her after over forty years, and what an impression she’d made on their life. My heart was so touched from the outpouring of love I experienced. Many of the visitors told me stories from her teaching days that I’d never heard. And they all told me how much she’d been loved. Not only her friends, but my friends who still live there, or who, like me, came back to their hometown for the event. To honor my mother. There was a reception after the book signing at one of my friends’ homes, and I had the opportunity to not only reconnect with a lot more of my high school friends, but to exchange stories of our parents, since our parents all knew each other as well as we did. That’s the beauty of a small town. It won’t be the same as it was when you were growing up. Because you’re older; you’re now an adult; not the teenager growing up and ready to spread those wings and fly away. Even though, like me, when you return to your roots, to your home town, you suddenly feel you’re back in those earlier days when we were still young, when our entire life was ahead of us. When we just knew we were going to make a difference in the world. But guess what. You and I did make a difference. We all did. In our own various ways. I learned that this weekend. We touched other people’s lives in ways we didn’t even realize, and in ways we’ll never know. Just by being who we were; who we still are. And for a little while that weekend I wished in a way I could be living back there again, as well as in my current city. We even made a few new friends, friends we will definitely keep. Funny how that works. I still miss my hometown. One thing I do know, though, I can continue going home. Because my heart will always be there. As will my memories. My memories in this daughter’s heart. Very sweet reflections, Deborah. I have had that same experience, but I have a grown son living in my home town. It is an emotional experience with so many past memories, while making new ones with our son’s family. Blessings on your book journey!